The week started big at MWC with Telefónica's launch of AURA, the "brains" of its 4th platform. With Aura, we enter into a new phase of Telefónica, the era of cognitive intelligence. As you know, our team at LUCA are experts on Big Data and AI, both of them key parts of this digital transformation. We hope you are as excited as we are with this new initiative. Apart from the exciting news of Aura, we took advantage of MWC to show the world several demos that represent part of the work we are doing here at LUCA. Besides showing them at our stand at Barcelona, we want all of you to have access, so we have been writing blog post about them, including a brief explanatory video. The demos showcase our products, some of which are still being built, such as LUCA Comms- focused on the value behind corporate communications data- while others are mature products already in the market, such as LUCA Store- understanding the behaviour of customers outside and inside stores, LUCA Transit- with our data-driven approach to commuting and pollution, and our road safety demo with Open and Mobile Data, and finally LUCA Audience- our solution for Outdoor Media players. But MWC was not just about demos and leads. We've had fresh news during this week. 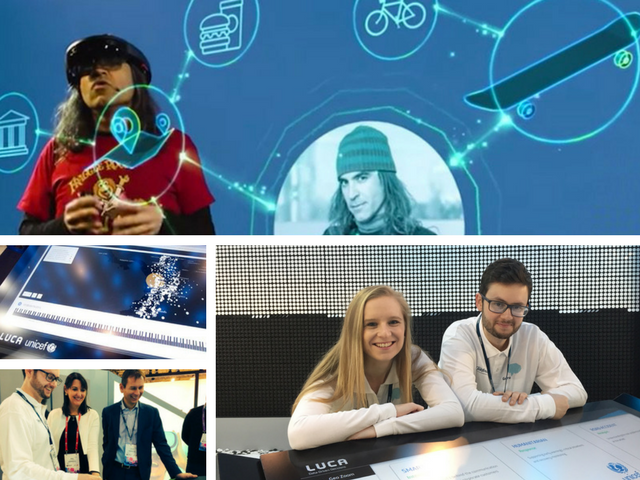 The MWC was the perfect occasion for LUCA to announce two partnerships we have been working on during the past months. Monday we announced our participation in GSMA’s Big Data for Social Good initiative. By leveraging big data capabilities of 16 mobile operators, this initiative will address humanitarian crises, including epidemics and natural disasters. Jointly, the participating operators account for more than 2 billion connections across more than 100 countries. The first trials will focus on epidemics and start from June 2017 in countries such as Bangladesh, Brazil (with Vivo), India, Myanmar and Thailand. And the exciting news doesn't end there. Tuesday, we announced our Big Data for Social Good partnership with UNICEF. Under UNICEF’s Magic Box initiative, real-time data from private sector companies like Telefónica is gathered to better understand humanitarian disasters. The first pilot of this partnership has been shown at MWC in a demo using mobile network data from Colombia to support UNICEF' by providing alarms and supporting critical response in case of natural disasters. We hope you enjoyed this year's MWC, and don't forget to follow our channels to stay tuned for our latest news and initiatives!